Released in September 1994, Master of Magic was first critized for its many bugs and bad AI, but its latest patch fixed almost all issues. There is a massive amount of content to this game, with plenty of cities, races, units and magic spells, that simply taking over your opponent is quite the undertaking. Best time on Impossible difficulty: Single-segment 0:01:18 by 'TravelDemon' on 2014-08-29. So, this will be my first run for SDA. 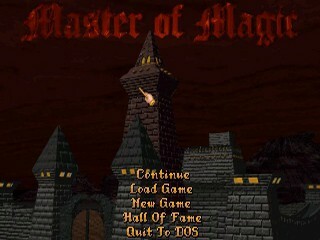 I chose Master of Magic because it's one of my favorite games of all time, and because the run for it is very short. First, I have to set up the world. Difficulty is impossible, naturally, no explanation needed. Opponents is once again self explanitory, as fewer opponents make a faster game, so of course I only put one opponent. Land Size is small, so there's less land terrain to explore, making it much, much easier to find them quickly. Magic is powerful, as this tends to make the AI expand slower, and I want to get them before they build a second city. Wizard portrait is aesthetic, and of no consequence. I use TrvlDmn because TravelDemon is too long. For my spell skill/attribute picks I take all 11 Life spellbooks, so that I can start with the Lionheart spell. You'll notice I also take the time to grab the prayer spell, which I normally use in the run, but things went so well this time I didn't need it. I put my race as Lizardmen, because all their units start with the swimming ability, letting them move across water, which synergizes with the low land mass world setting. The strategy here is pretty simple, I set my magic balance entirely to generation, to get the mana to cast lionheart. I immediately move my 2 starting units out and begin searching for my enemy. I can usually find them pretty quickly, but the speed at which I do here stuns even me. In fact, I find them too fast, as I haven't had enough time to cast Lionheart on both my units, so I move around a bit, and get in a fight with a settler twice, which is too bad, as it costs me some time. I come back up to their city, and then proceed to destroy with my now incredibly powerful Lionhearted Lizardmen. Usually I also need the prayer spell to take the capital, but they didn't have the time to build the proper defenses, so I don't need it.